Still, by far the strangest Colombia food I’ve eaten is hormigas – the giant toasted bacon-popcorn-tasting ants, but I recently visited three different Colombian restaurants in London and tried different versions of plantains, yuca (cassava) and delicious, huge steaks as well as ox liver, ox tongue and some delicious fresh fruit drinks. The first restaurant we went to was the loud and lively Latin Corner on Camden Road where I ate a massive steak plate called Sobrebarriga dorada. The tables surrounded a bar where they sell, among the usual choices, Colombia beer. The atmosphere was alive and a few people stood up to salsa near the tables. Twice we went to La Bodeguita in the Elephant & Castle Shopping Centre, the area of London where the biggest Colombia population lives followed by Stockwell and Brixton. La Bodeguita had a quieter, more relaxed atmosphere than the Latin Corner – better for conversation – but still with Latin American music and it does turn into a party place later in the evening. Here I tried Carne Asada, another steak dish as well as well as the ox tongue – Lengua a la criolla – which was suprisingly tasty. To drink, I had guanabana juice/smoothie. Yum! For a friend’s birthday, we had dinner at Leños & Carbón on Rockingham Street, also in Elephant & Castle. A bit of a different atmosphere with a mix English and Latin music. I ate ox liver here and had an excellent fresh lulo juice – which is a sweet tropical fruit that somewhat resembles a kiwi in certain ways, I am told. Lulo juice is amazing, and it’s unfortunate you can’t find the fruit to buy in the markets like you can with some other oddities that Colombians enjoy like mamon. In all three restaurants, the waiters were incredibly friendly and talkative, joking and laughing with us. The prices were very reasonable. The food and drinks were delicious at all three of them as well. I’m sure there are some other good Colombian choices hiding in London. I also stopped in Brixton Market the other day to buy buñuelos from a vendor who was also selling cheesy arepas. If you can recommend any other places in London to find delicious Colombian food, leave a comment. Editor’s note – For anyone interested in Colombia, check out my blog from when I lived in a village called Mogotes in the Santander region of Colombia for six months in 2011 – http://www.littlecolombiaobservationist.com (A Colombia version of LLO!) Also, you can see my Flickr photos from my Colombia experience here. 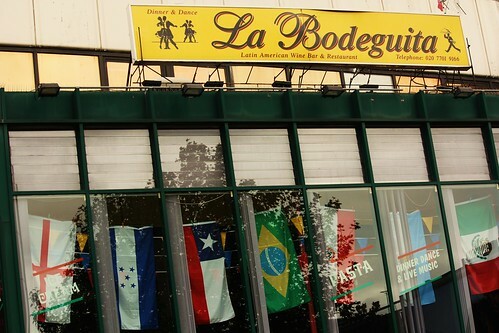 I live quite local to La Bodeguita and love that place, I’m having my leaving do there tomorrow evening and can’t wait! I will certainly check out your other two recommendations – thanks for posting up. Just recently opened on Elephant Road, is Chatica – the newest & latest venue for all things Colombian. This place is a mecca for excellent well prepared food using the finest ingredients rarely seen in most other restaurants. They have their own in-house bakery making delicious cheese breads daily, soft breads and their famous Empanadas – which is a must try. There is no other Colombian venue that matches this place for the quality of food or standard of service. Highly recommend taking a trip there. interesting stuff – I am hunting for cassareep to make guyanese pepperpot, sounds like I might find some at E&C – thanks to all! I’m Colombian and my husband and I just went to La Chatica and we didn’t like it. Most of the food (pandeyucas, pasteles, empanadas, sandwiches) wasn’t fresh. The only thing that I recommend is the bread because it’s fresh and delicious, but the empanadas are much better at La Bodequita. Cafe Mambo in Fulham Road. I’m colombian and I still can’t believe my luck! To have a colombian restaurant (a small one, more a cafe than a restaurant but still great!) so close to my home is a blessing. The owners are adorable, the food is great, just like the food your mum will make for you if you were visiting the country after years of absence: tasty and in CRAZY quantities! The Bandeja paisa is by far my favorite -especial mention to the tajadas de platano and the crunchy chicharrones- The ajiaco, carne asada and the bandeja caleña are also nice. They also sell all kind of colombian “postobon gaseosas” the yummiest fuzzy drinks ever! But if you are on the healthier side, they have all kind of fruit juices: piña, maracuya, lulo, guanabana, everything! You can also buy the fruit pulp puree frozen to make the juices at home, not as good as fresh fruits, but good enough when you are kilometers away from home. During Christmas time they make tamales and once again: delicious! The only thing that is not that good are the arepas, I have never had fresh made ones (at least they didn’t taste like) they seem to be frozen ones heathen in the microwave which leave them all soft and bland. Oh my god, I’m hungry!!! Great article Colombiana – Do they make my absolute favourite: Sancocho? Yum! Most likely 🙂 Haven’t been in a while so can’t remember off the top of my head. Do any of you know where I can buy Aguila beers? Good luck and have one for me! This used to be my favourite spot when I lived locally, miss it so much! My family is from the Dominican Republic so I love my latin food and dance… At La Bodeguita I loved cuajada and dulce de leche dessert. Anyone know of a good Colombian restaurant in Hounslow/Middlesex? Does anyone know a place in North London you can buy Aguardiente Antioqueño? There is a new Colombian restaurant in London called Sabor, 2 Tooting Bec Road, London SW17 8BD, http://www.saborlondon.com http://www.fb.com/Saborthelatinway . Its the best Colombian food in London and much cleaner then the other Colombian restaurants. Thanks for this post! I used it to help me plan a day of ‘travelling’ Colombia in London. I followed your suggestions to check out Brixton Market where I ate cornbread, chorizo and the tastiest fried beans at Rancho de Lula, then went to la Bodeguita in the evening, loved it! Does anyone know if its possible to buy Apostol Beer from Medellin in London?